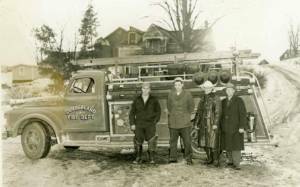 With the beginning of the 1930’s, the residents of Guilderland realized they needed their own fire department. On June 1, 1931, the Town Board of the Town of Guilderland adopted a resolution by which certain inhabitants of the town were appointed to form a fire company. On the night of June 4, 1931, the newly-organized Guilderland Volunteer Fire Department held it’s first meeting in the Charles Bohl’s garage on Western Turnpike. Jesse Wood was chosen to act as temporary chairman to elect officers. Charles Tompkins was elected chief and Floyd Bradt was elected clerk. Highlights of the second meeting included the appointment of a committee to draft a set of by-laws. The next significant meeting was held March 1, 1932 after the department met with the state underwriters and decided to purchase the following equipment: 1,000 feet of hose, two hose carts from Fultonville, three ladders, and other smaller items. During the year 1933, there seemed to be a loss of interest in the department and there were very few fires during the period. In 1934 only on meeting was held, the annual meeting and election of officers. During the years 1936 through 1940, the lack of interest continued. As a result, there were very few, if any, meetings held. On June 10, 1941, Oman Schaadt was elected chief and a reorganization of the department commenced. Due to this reorganization and an investigation into firematic laws, Thomas VanWagenen, Sr. was elected chief. In the spring of 1943, a used power and light truck was purchased to carry the equipment, thus terminating the use of the hose carts. On September 29, 1944, the fire department accepted delivery of a civilian defense trailer pump and various other equipment. This was the first power pump in the hamlet. The Guilderland Fire Department was incorporated in July, 1948 under the laws of the State of New York. In 1950, the fire district was enlarged and placed under the control of the fire commissioners. Funds raised by the department through street dances, card parties, and bingo games were used to purchase the property for the new firehouse. In January 1951, the commissioners signed a contract to purchase a new Dodge truck and body to give the fire department the first complete “fire truck” for the district. This was a happy time for the department, which now had a functional piece of fire equipment to work with. From late 1950 through 1957, the members of the fire department were busy with the construction of a new firehouse. In the mid 1950’s, a scout troop was sponsored by the department. The big event of the year 1956 was the 25th anniversary of the fire department. The celebration was held on June 9, with a special event naming Thomas VanWagenen, Sr. as Honorary Chief for his 25 years of service. At the end of 1957, a district vote was taken and the purchase of a new fire truck was approved. In January 1958, the fire commissioners signed a contract for the building of a new fire truck, which was delivered on June 1, 1958. Because of the rapid growth of the district over the previous eight years, this truck was sorely needed and was proudly put into service. On November 15, 1958, the fire department held it’s first dedication. This was a significant event, as it was to dedicate the newly purchased fire truck and the recently completed “new home” for the fire department. During the 1960’s, stock car races at Victoria Raceway served as a way for the department to raise small amounts of money. In exchange for supplying a fire truck and several parking attendants, the department received 25 cents for each car that was parked. In October 1960, the lot behind the firehouse was purchased for use as a parking lot. In 1966, plans were made to expand the kitchen area and add a room to house the town owned compressor for filling air bottles. Also during that year, the meeting hall was refurbished. In 1969, the department purchased a used oil truck to be used as a water tanker. The office was converted to a truck bay for the tanker, with the installation of an overhead door. 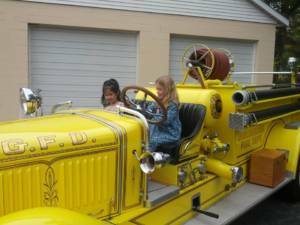 In August of that year, the 1930 Mack fire truck was purchased to be restored for use in firematic competitions. In November 1969, a bond issue for the purchase of a new fire truck was passed by the voters of the district. The new truck was ordered in May 1970 after the writing of the specifications. In early summer, construction of a new addition was started to the easterly side of the firehouse. The new addition was to house the new fire truck, which arrived in the fall of 1971. Dispatching of the fire department began in 1972 by a new town-wide dispatching system. In December 1972, the firehouse was sold to the district. At the 1973 Installation Dinner, a bell was presented to Ernie Radley for his 25 years of dedicated service as Commissioner of the fire district. Also, in late 1973, the original hose cart was restored to be used in parades. In November 1976, work was started on a small addition to the lounge area of the firehouse. In July 1979, a new turbo diesel Mack fire truck was placed in service, with its dedication held in October. Shortly thereafter, the rebuilding of the “Old Mack” was completed and it has been winning trophies at parades ever since. At the 1980 Installation Dinner, a bell was presented to Thomas VanWagenen, Sr. for his 50 years of dedicated service as a Guilderland Volunteer Fireman. IN the summer of 1980, the department sponsored a Little League team, which finished in second place. The year 1981 marked the 50th anniversary of the Guilderland Volunteer Fire Department, and started with a grand Installation Dinner and the presentation of a plaque and gold helmet to Thomas VanWagenen, Sr. The department held a field day with firematic games, an antique fire equipment muster, game booths, refreshments and dancing. At the Albany County Volunteer Firemen Convention, Delmar, New York, in the fall of 1981, Thomas VanWagenen, Sr. was named the Albany County Fireman of the Year. In October 1982, the membership voted to enter into the E.M.S. First Responder’s program. As of midnight, May 3, 1983, First Responders went into operation and began answering emergency medical calls. In February 1984, the membership voted to purchase a squad truck and donate it to the fire district. This truck was delivered and put into service in October 1984 for answering all EMS calls and carrying other fire equipment. In the spring of 1984, the fire district took delivery of a new 750 gallons per minute pumper. With the delivery of this new pumper and the new squad truck, the district took its first pumper purchased, the 1950 Dodge, out of service. 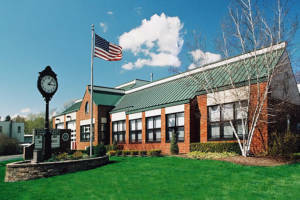 In 1989, the fire district purchased the property on the west side of the firehouse with anticipation of using the parking lot for building expansion in the future. The house on this property was used extensively for training and drills. Due to its structure and location, it served as an ideal facility for these purposes. In August 1992, a fire district budget meeting was held and included discussions of the firehouse upkeep and operations regarding same. A building committee was formed at this meeting. It was determined that within five years, funds would be needed to perform extensive repairs on the current firehouse, or it would be necessary to consider construction of a new building. In September 1992, the 1971 International truck was sold to the West Edmeston Fire Department. A new Salisbury 1500 gallon per minute pumper with a ten man enclosed cab was ordered, and delivery was made in December. This truck was placed into service in February 1993, ending the era in which firefighters rode on the back steps of fire trucks. Also in February, the department took delivery of a new Ford Crown Victoria, the first district-owned Chief’s car. In the spring of 1993, the department hosted a gala “Wetdown” with the participation of the neighboring town departments to celebrate the acquisition of the new truck and Chief’s car. During this period, the property on the east side of the firehouse became available. However the district determined that use of this property for expansion was not feasible due to its location and the age of the building. In early 1993, an architect was hired to draw up conceptual plans to design a new firehouse and determine the approximate cost. Later that spring, the Board of Commissioners gave approval to proceed with the plans for construction. On August 31, 1993, a bond resolution was passed by the district residents allowing the district to authorize the construction of a new firehouse. Construction began in May 1994, after the bid opening and contract award. The new bays were build on the west side of the existing firehouse. All equipment and supplies were then moved into the new bays, which served as a temporary meeting place and storage facility. The old 5,000 sq. ft. firehouse was torn down, and the new building’s offices, kitchen, and hall areas were built on the east side of the new bays. The expected completion date for the new 10,000 sq. ft. firehouse was May 1995. This was celebrated with an open house and dedication ceremony at the firehouse on Saturday, May 20, 1995. Also, in May 1994, the department’s squad truck was sold to the F.B. Peck Hose Co., Waterford, New York. A new Kenco Fabrication Co./ Freightliner squad truck was ordered with anticipated delivery in summer of 1995. This new squad truck has a mobil air unit enabling the department to refill SCBA air bottles at the scene of an emergency. Throughout the years, the Guilderland Fire Department has participated in the Residential Opportunities, Inc (ROI) Field Days held at Tawasentha Park, has held fund raising car washes, organized bicycle rodeos for children, and continues to sponsor a Little League Team. The department holds Christmas caroling hayrides through out the district and visits neighborhood children with Santa Claus on its annual “Santa’s Ride.” The department continually strives to support the town with the highest degree of integrity and professionalism it can offer, both in performance of firefighting duties and while participating in social activities.